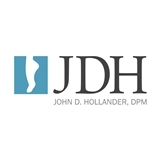 John D. Hollander, DPM (Santa Rosa) - Book Appointment Online! Our office motto is to be "The Best Podiatry Office in the World." We love what we do and our patients know it. We are often told by our patients and other medical offices that we are the friendliest doctor's office they have ever be too or worked with. Keeping people on their feet one step at a time is our specialty!